Making Pizza Dough can’t get any easier than this! 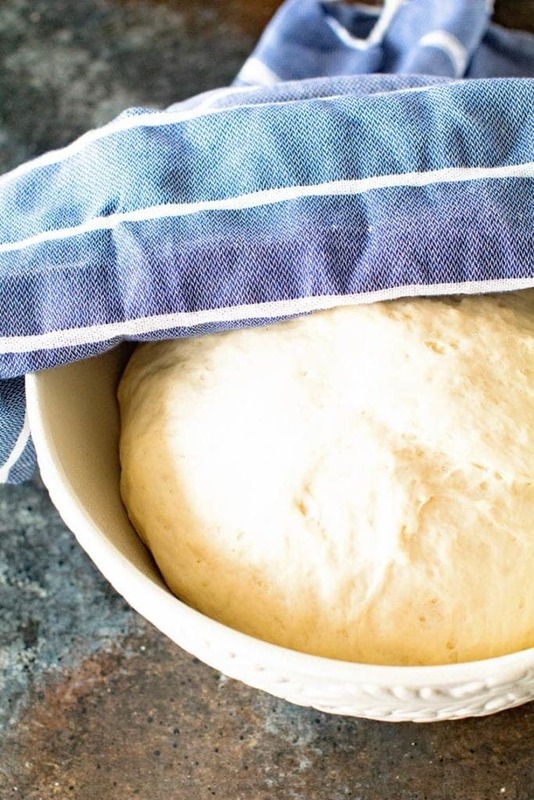 If you’ve been scared to try to make homemade pizza dough try this recipe. 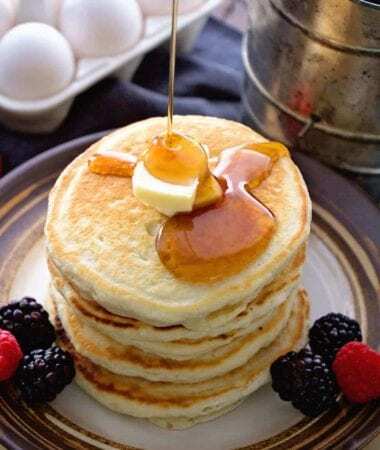 It comes together quickly and is perfectly thick, chewy and delicious! 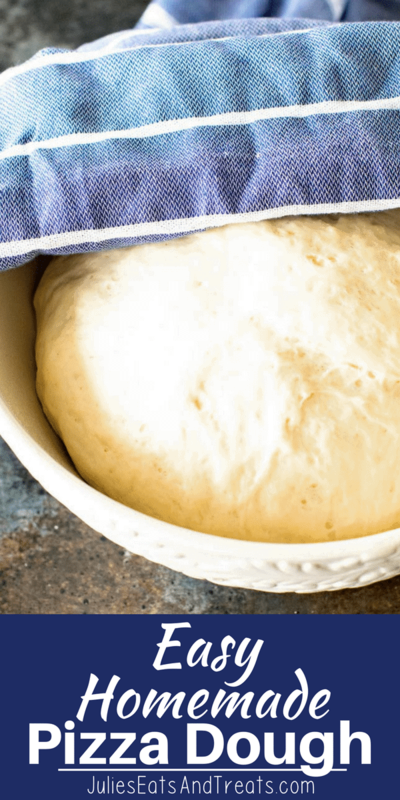 This homemade pizza dough is so quick, easy and FAST! I’ve been trying pizza dough recipes for years and I finally found the “one”. I usually don’t plan to far ahead so I need one that would rise quickly and be ready to baked for me! This one is the winner. I just love it and it’s become a staple in our menu. Until lately I was terrified of doing anything that contained yeast, but I’ve slowly gotten over that fear with these Cinnamon Rolls and Caramel Rolls. I figured it was time I mastered the art of homemade pizza dough. I tried plenty of recipes but this is the one that we have used over and over again. This one is FAST! It only takes 30 minutes to raise! So I can make this then do a few things, like stick laundry in the washer or homework with the kids, come back and it’s ready to make! Not only do we love to bake homemade pizzas, but our favorite way to make pizza is grilling it! It just takes it over the top and we can’t get enough of it. I’ve listed some great tips for making the perfect pizza dough along with directions for freezing extra dough. This recipe does make two pizza doughs, but it’s easy to freeze and so handy when you want pizza! Make sure you use warm water, not hot, not cold, just warm. Your yeast won’t work if you use hot or cold water. Salt. Salt adds a bit of flavor to the pizza dough. All the toppings in the world can’t add flavor to the dough, so don’t miss this step. Use quick rise yeast. This is my yeast of choice, it rises quicker and who doesn’t love quicker pizza production? Also, quick tip, keep yeast in the freezer. It extends the shelf life for months past the expiration date! If the dough is snapping back while you are rolling it out, let it rest! Cover the dough with a damp paper towel and let it rest for 5-10 minutes. Then go back to shaping it again. The short rest helps the gluten in the dough relax and it becomes easier to work with. The dough will also be less prone to tearing when you give it he rest that it needs. Brush a little olive oil around the edges of the crust. This lets the exposed crust become a golden brown while baking in the oven. After rolling out the dough use a fork and stab it a few times. This helps so you don’t get those air pockets when it bakes. Divide the dough in two pieces. Transfer to lightly floured surface, roll each piece of dough into a smooth, round ball. Wrap dough tightly in plastic wrap and then place in quart-sized Ziploc bags. Make sure to squeeze as much air from bag as possible when freezing. When you plan on using the dough, take dough out of freezer in the morning. Keep it in the bag and transfer to fridge. When it’s dinner time take the dough out of the Ziploc bag and plastic wrap. Transfer to lightly floured surface. Cover the dough with a damp paper towel and let it stand at room temperature for at least 30 minutes. Then prepare like normal! You can also par bake pizza dough or grill it (minus the toppings) and then freeze the prepared dough between parchment paper in Ziploc bags for easy dinners. Use a pizza stone to get the pizza to evenly cook all over. A pizza stone also helps make the bottom of the pizza perfectly crisp and the inside soft and chewy. If you are using the pizza stone make sure you place the pizza stone in your oven while it preheats. Then let it sit in there for 30 minutes after it comes to temperature. Just start this process while you make the dough! Use a pizza peel to transfer the pizza from being rolled out to the pizza stone. If you want to use corn meal I recommend placing parchment paper on top of the pizza peel and sprinkling cornmeal over the top. Move the dough ball to the pizza peel and roll out with rolling pin or fingers. Then slide off the parchment paper and onto the pizza stone once you have prepared your pizza. Bake pizza at 500 degrees F for 8-12 minutes. This seems like a high temp but this is how you get it crispy and we want crispy! Or you can grill it too! You want the grill HOT again. Then follow these steps – Place pizza dough on grill, olive oil side down. Brush top of dough with olive oil. Cover grill and cook 1-2 minutes. You’ll want the dough set, but not crispy. Flip dough over, top with toppings. You want to do this quickly, if you want to take more time, remove pizza dough and top then place back on grill. Cover grill and grill 3-5 minutes or until ingredients are hot and cheese is melted and the crust is crispy around the edges. You can also use a pizza pan if you don’t have a pizza stone. Cut a piece of parchment paper to fit the pan you’re using and place pizza pan in oven as it preheats. Removed from oven once it is preheated, please be careful as the pan is hot. Place your pizza dough on the parchment paper on pizza pan. Top with desired toppings. Place back in the oven and bake. Making Pizza Dough can't get any easier than this! 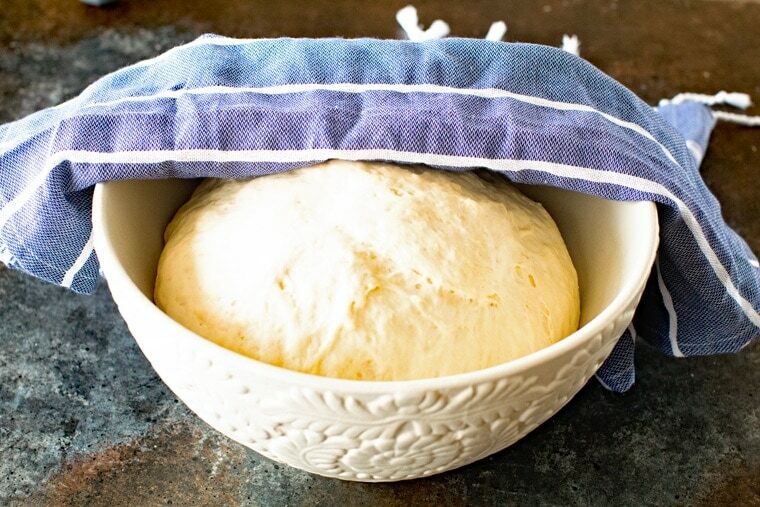 If you've been scared to try to make homemade pizza dough try this recipe. It comes together quickly and is perfectly thick, chewy and delicious! In a mixing bowl add water, yeast and sugar. Stir and then let proof for 5 minutes. Add salt, honey, garlic powder. Slowly add in 2 1/2 c. flour while mixing in stand mixer with dough hook. Add in remaining flour 1/2 c. at a time, until dough doesn't stick. This may take more or less flour, adjust as you add it. Form into ball and kneed with dough hook until smooth. Spray second bowl with non-stick cooking spray and place dough into bowl. Cover with towel, place in warm area of kitchen and let raise 30 minutes. The longer it rises the better. You want it to at least double in size. When ready to make pizza divide dough in half. Turn out one half of dough onto a lightly floured surface. Sprinkle with more flour if needed so you can stretch and flatten the dough to your desired pizza size. Top pizza with desired toppings. Transfer dough to pizza stone. Place in preheated oven at 500 degrees F. Bake 8-12 minutes. You can also use a pizza pan if you don't have a pizza stone. Cut a piece of parchment paper to fit the pan you're using and place pizza pan in oven as it preheats. Removed from oven once it is preheated, please be careful as the pan is hot. Place your pizza dough on the parchment paper on pizza pan. Top with desired toppings. Place back in the oven and bake. Divide the dough in two pieces. Transfer to lightly floured surface, roll each piece of dough into a smooth, round ball. Wrap dough tightly in plastic wrap and then place in quart-sized Ziploc bags. 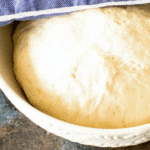 I love homemade pizza dough and your post provides so much valuable information!! 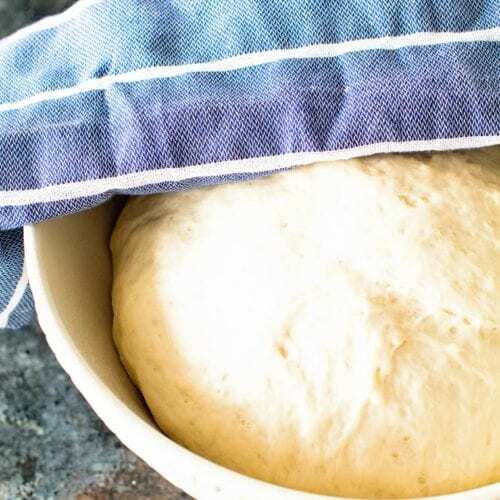 Can’t go wrong with homemade pizza dough! Home made pizza dough totally makes the pizza! I have learned that for sure!